What Makes A School Bus Crash Unique? Bus drivers have a special responsibility to keep children safe. Yet since 2003, hundreds of children have died in school transportation-related crashes. These families must endure almost unendurable grief and are therefore entitled to substantial compensation. No amount of money can replace the loss of a child, but it can at least assuage the grief and provide some closure. These incidents raise complex legal issues as well. Rockford school bus drivers are almost always school district employees, even if they are only temporary or volunteer drivers, so third party liability usually applies. Negligence cases usually begin with legal duty, which is the responsibility that drivers have when they get behind the wheel. School bus drivers are held to a higher standard in Illinois because they are common carriers. This duty applies to driving behavior. For example, a noncommercial driver can usually proceed through an intersection on a green light. But common carriers must usually pause and make sure that the intersection is clear. Passengers in common carrier vehicles are entitled to special protection as well. In fact, common carriers are almost insurers of safe conduct. Therefore, school bus operators must drive very carefully and also maintain some semblance of order on the bus. Sometimes, that latter responsibility falls to a bus monitor or event chaperone. As far as Illinois negligence law is concerned, these individuals are common carriers as well. Speed is one of the leading causes of school bus crashes in Illinois. Most of these vehicles are very long, yet they still only have four axles. So, they are difficult to control, even if the weather is good and their speeds are low. Many car drivers can exceed the speed limit and not breach the duty of care. But that’s usually not possible for school bus drivers. So, even four or five miles per hour over the speed limit may constitute a breach of duty. Take their eyes off the road (visual distraction). It is almost impossible for drivers to focus on the road with a busload of rowdy kids. That’s not an excuse for negligence; it’s simply a fact. This situation makes third party liability even more important. 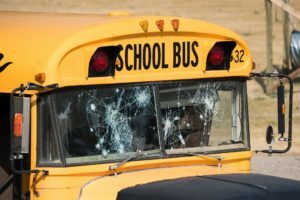 Some school districts simply expect their drivers to do too much, and a personal injury attorney is in a good position to force change. Scope of Employment: Transporting passengers to and from their destination is obviously within the scope of employment. So is driving an empty bus back and forth from the garage and any other activity which benefits the school district in any way. Employee: As mentioned, pretty much anyone who takes the wheel of a school bus is a school district employee in this context. The district controls the driver in terms of things like route driven and hours worked. That control is all that is required. School bus crash victims may be entitled to substantial compensation. For a free consultation with an experienced personal injury lawyer in Rockford, contact Fisk & Monteleone, Ltd. We routinely handle cases in Winnebago County and nearby jurisdictions.